This article gives you an idea about Home painting tips, Paint types, Best paint brands, Painting procedure, Exterior painting, Failure of paints & its causes. 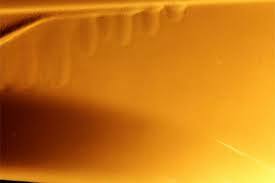 They are water based paints in which the paint material is dispersed in a liquid that consists mainly of water, for suitable purposes this has advantages in fast drying, low toxicity, and low cost, easier application. It is most commonly preferred for interiors because it gives a rich texture & matt finish, so it is aesthetically appealing. Emulsion paints are washable with soap and water therefore dirt & stains can be washed away. It is acrylic base paint so it is durable & Emulsion paints are fungus & algae resistant to an extent. They are oil or solvent based hard paints & are mixed with thinners or linseed oils before application. They mostly provide glossy finish and are commonly used for metal surfaces, they are not preferred for interior walls as it traps moisture inside because it forms a non-breathable film on drying. It finds special application because of the water resistant property. Distempers are the most economical method of painting, they are water based paints which consist of chalk, lime, water base & coloring pigments. Distempers are most commonly called as ‘white washing’. Distempers are not durable comparatively & gives only an average finish, so it is not preferred for home interiors. 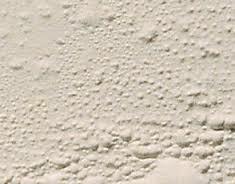 • Newly plastered surfaces must be allowed to cure for at least 35 to 45 days before painting. • To ensure long protection, the surface to be painted should be free from dust, grease and any loose materials. • Remove any fungus and algae growth thoroughly by brushing it vigorously with wire brush and then cleaning it with Bleaching powder solution in water (10% Bleaching powder is dissolve in 1 litre of water, filter the solution & apply by brush or sponge). This treatment should be done with greater care on the top of the awnings, sunshades, parapets and other horizontal surfaces where water is likely to accumulate during monsoon. • Previously oil painted surfaces, should be sanded thoroughly to remove loose particles and made dull and matt for better adhesion. Exterior rough surfaces, previously coated with cement paint, should be wire brushed and washed with water thoroughly and dried completely. Before painting, ensure that the surface is free from chalking. • The exterior surface should not be affected by any water or by constant dampness. If you are painting during the rains allow for 2-3 days of total sunshine for the surface to dry out completely and before commencing painting. 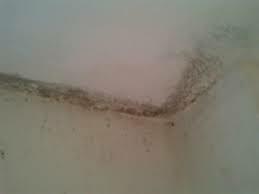 • Check surface for incidence of dampness or water seepage. • Rectify the water seepage problem at source. This could mean repairing leaking pipes or cracks in the exterior walls. • Any loose plaster should be removed from the wall. Check for loose plaster by tapping on the walls. A hollow sound indicates loose plaster. • Please ensure proper curing time (7 to 21 days depending on extent of plastering). 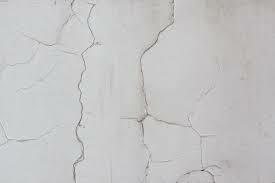 When re-plastering is done it should be given proper drying and stabilizing time to bridge the cracks or smoothen the surface. It is the powdering of the surface paint due to external exposure mainly due to lack of paint binder or bad base coat. Remedial measures requires through washing & rubbing down the surface affected to provide a sound base for adhesion and sealing then applying a new coat. It is the bubble like formation due to loss of adhesion between the wall and the paint, basically the paint film will be intact but the adhesion between the base and paint film will be destroyed. 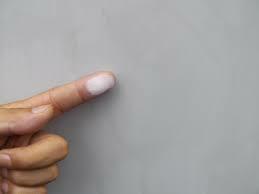 Blistering of paint surface is due to trapped moisture which forces up the paint film into little bubbles or blisters. Crazing is due to hard drying paint being applied on a soft undercoat i.e. 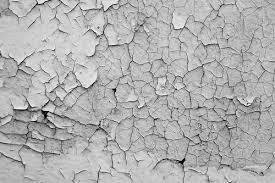 One that is not fully dry which causes irregular cracking of the surface paint. Remedy is to completely strip the affected areas and paint. 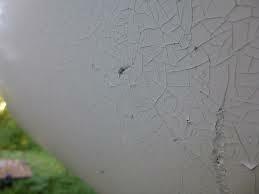 Cracking of paint film is due to the unequal expansion or contraction of paint coats. It usually happens when the coats of the paint are not allowed to cure/dry completely before the next coat is applied. Flaking is lifting up and peeling away of the paint due to loss of adhesion. It is caused by applying paint over a moist, greasy, chalky or any other insecure surface. Most commonly due to improper surface treatment before application and inherent moisture/dampness being present in the substrate. This type of paint failure occurs when the paint runs down in drips. This is due to bad workmanship i.e. the uneven application of paint or paint which is too thick which causes it to run. One of the main causes of moisture is leaky sanitary fittings & water retention by dry leaves or plants growth. Prolonged moisture leads to discoloration & fungi, Fungus Aureobasidium pullulans is one of the species prominent for damaging wall paints. I’ve been working as a civil engineer for the past two years & have experience with almost all paint brands mentioned above. Based on my personal experience I suggest Berger paints first & then Asian paints for long lasting shine. British paint is also very good. I really like the list of what can go wrong with a given paint job. I know here in Sacramento, we are getting ready for painting season (low humidity months) and there are a ton of people looking to paint their homes. Whether painting the interior or exterior of your house, you should try the colors on the surface. It might look totally different from the way it looks at the store. You can also do this if you’re getting your home professionally painted by a contractor. Great article on some of the things most people overlook when painting; especially what can go wrong. We believe that prepping an area for paint, along with inspection of the area to be painted is just as vital as the actual application. Anyone can paint, but it takes skill and experience to be a painter!